A brand-new and unique form of garden primrose! Totally hardy primrose, it really is something different for pots and garden borders. Supplied as a pack of 6 jumbo plugs. A sublime colour combination and a must for any garden. A compact Primula Acaulis growing to just 10-12 cm (4-5in) tall, but with stunning visual impact. From January May each year you'll be treated to a visual feast of unique blue-veined flowers with a sunshine-yellow centre - totally unique colour combinationa and perfect for pots and containers. The blooms are lightly fragranced and produced above a neat rosette of semi-evergreen, ribbed leaves. LIMITED STOCK! so order yours now to make sure that you don't miss out. 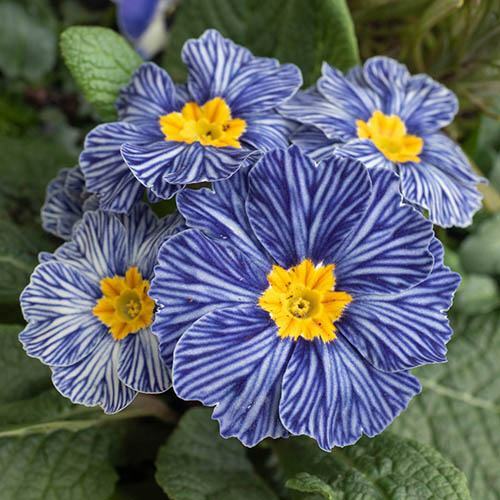 Primrose plants enjoy moist, well-drained soil. For best results, plant out from July to early October.